The Qatar Masters Open 2014, which is considered to be the strongest open in Asia and one of the strongest in the world, has come to an end today. The tournament was kind of divided into three parts: first of all, there was the outstanding series of wins by Giri; then Vladimir Kramnik stopped him, and attracted everybody's attention, winning six games in a row in turn. At that point, no one seemed to be able to stop the former World Champion who was going at full speed. However, the end was quite surprising: Chinese GM Yu Yangyi, who had appeared at the top as if out of nowhere, defeated Giri, then Kramnik, and took the clear first place. In the final round, the anti-Berlin has worked well for him: 1.e4 e5 2.Nf3 Nc6 3.Bb5 Nf6 4.d3! As expected, White got a slight edge after the opening, which wasn't easy at all to convert into anything real. However, at some point Kramnik started to play a bit recklessly, which is all the more strange considering the tournament situation (a draw would do for him). 19...f5?! 'If you need a draw then you shouldn't play for a draw', a famous theory says, but the fact that there is no panacea is also well-known. 19...c5, trying to improve the things on the other side of the board, would have been more reliable. 20.exf5 gxf5? This obvious decision ('pawns should take towards the center') has serious drawbacks; instead, 20...Rxf5! is correct, where the straightforward 21.Qc3 doesn't work due to 21...Raf8!. 21.Qc3 f4 (probably 21...Bxa5 22.Rxa5 f4 23.Bxa7 Nd4 is the most tenacious) 22.Bxb6 cxb6 23.Nxc6 Qd6? This mistake is decisive. Black could still have kept some chances by 23...Nd4! 24.Nxd4 (24.Nxe5? Qd5!) 24...exd4 25.Qd2, although the compensation for a pawn is hardly sufficient. Almost immediately after his triumph, Yu Yangyi joined the official commentators Daniel King and Simon Williams. Very soon it appeared that his English isn't too fluent yet. Among a few things he was able to say in English, the spectators could understand that he hadn't considered his chances fot the 1st place too high before the game, that he liked his encounter vs Kramnik more than his other games in Qatar, and that the alternative to 8...Bb6 is 8...Be7 which doesn't allow 9.Ng5 but allows 9.Na5!? In general, putting aside the magic of big names, Yu Yangyi's success is hardly a big sensation. 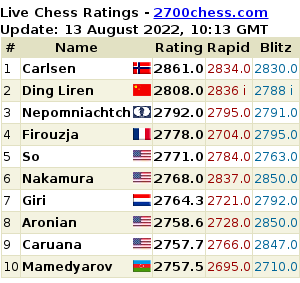 He had already achieved an outstanding success in the Tromso Olympiad earlier this year, winning the 3rd board with 9.5/11 and showing the Elo performance of 2912. It's many thanks to his brilliant play that China won that Olympiad, and the world has learned that the Chinese also cry. Below you can find all the games played in Qatar Masters by the winner. Anish Giri has managed to finish on a major mote, beating Vladimir Akopian with Black in the long chaotic battle. This has brought him the tie for the 2nd place with Vladimir Kramnik. It's worth mentioning that Giri hasn't drawn a single game, having the revenge for his previous tournament (Tashkent Grand Prix stage) where he had drawn 10 (!) games and lost the remaining one. The penultimate round of the Qatar Masters Open saw yet another victory by Vladimir Kramnik, who has prolonged his series to 6 consecutive wins, and the second loss in a row by the former leader Anish Giri. After 4 rounds, the Elo favourite Anish Giri (2776) has grabbed the sole lead with the perfect score in the extremely strong Qatar Masters Open. Shakhriyar Mamedyarov, Nils Grandelius, Pavel Eljanov, Yuriy Kryvoruchko and Evgeny Tomashevsky are half-a-point behind. There are 5 more rounds to go, so the situation can still be changed many times. Here is the impressive miniature Giri has played against Ukrainian GM Mikhailo Oleksienko (2620). Giri Has Been Reached. Is It Caruana's Turn? 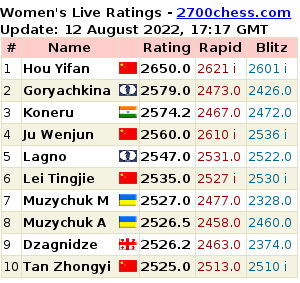 As we already reported the world champion Hou Yifan already assured first place after finishing her penultimate round game against Kosteniuk in a draw. The result didn't come out of any extraordinarily tough fight, however, it is still interesting due to the creatively played opening.